Q. I understand that there used to be an RAFES plaque that could be put on a Helper's memorial or grave headstone. We would like to do this for a member of our family who was a Helper. Where may I get one? R. The desire to honour the gallantry and bravery of a member of your family in this way is admirable. However, there are now no more plaques. Since the Society no longer exists and the assets of the RAFES Charitable Fund have been distributed, there is now no way of providing any new or replacement plaques as a means of recognising the gallantry of helpers, even to those with a verifiable claim. How families word inscriptions on headstones and memorials is of course entirely a private matter for them. Q. I am researching a member of my family who served in one of the Royal Air Forces and escaped or evaded during WWII. How do I find out more about his escape or evasion? R. In London The National Archives at Kew (formerly the PRO) and Air Historic Branch (AHB) have files of debriefing reports conducted by IS.9 of many (but not all) who successfully escaped or evaded. These debriefing reports were originally designated 'Secret' for the protection of the escape lines. Later, they were restricted as there was also the possibility that in the uncertainties of the Cold War, the Helper systems and networks might one day be needed again. chronological account of what the evader did, who they contacted up to the point at which MI.9 took them over. Helper names are usually omitted and accounts often end with the remark 'I was then put in contact with an organisation' or 'From this point my journey was arranged for me'. Not all those who escaped or evaded are in the listing but it is a good start. A bibliography on RAF Escape and Evasion is linked to this website. These days probably the best source of information is the Escape Lines Memorial Society. R. Look at the bibliography to see if your interests are covered. It is likely that unless you are very fortunate, published accounts will not cover your specific interests in the detail you require. The RAFES files are now in the care of the Imperial War Museum London. You should also contact your relevant national or regional association. Christopher Long has some excellent information on the Pat O'Leary Line in which his family were among the pivotal players. A detailed and authoritative account of escape and evasion on several lines, including Pat, Comet, Burgundy and Shelburn is in 'Silent Heroes: Downed Airmen and the French Underground', based on a thesis by Mrs Sherri Ottis>, published by the University Press of Kentucky in April 2001. 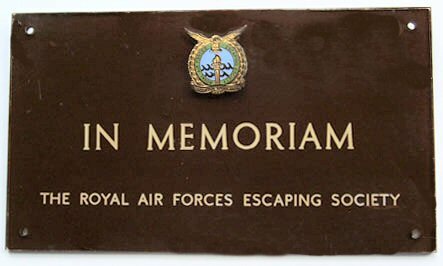 However these days probably the best source of information is the Escape Lines Memorial Society. Q. Are there people willing to come and talk to groups and organisations in the UK about RAF Escape and Evasion? Q. I wish that there was a way to continue the work of the RAFES and at the very least I would like to make a donation. R. The RAFES thought long and hard about whether to continue. It was a sad step after all that has been put into the Society's activities over so many years. However, it was felt it was the right course to take while the Society still had the energy to wind up its affairs in a business like and dignified manner. The general charitable work of the Royal Air Force Benevolent Fund, or the equivalent in your own country, would appreciate the support provided by any donation you wished to make. Many members of the Society keep in touch with their Helpers. These contacts in many cases have continued between the families even though the Helpers and the aircrew they aided have now died. The Royal Air Force Benevolent Fund, 67 Portland Place, London W1N 4AR .. and please mention that you were directed to the RAFBF by the RAFES website. Keeping in touch with helpers and keeping alive the memory of the various escape lines is actively supported by the Escape Lines Memorial Society. Q. What does the motto 'Solvitur Ambulando' on the RAFES crest mean? R. Saved through Walking, though this is probably not a purist's translation. Q. How do I contact the editor of this website?